BBC News - Did climate kill off the Neanderthals? Climate change, we're told, poses the single gravest threat to the survival of our species. And if the experience of our ancient relatives the Neanderthals is anything to go by, we should take note of the warnings. Recent research has suggested that climate change may have been the killer blow that finished off our closest evolutionary cousins. For about 400,000 years, the Neanderthals dominated Europe, hunting big game such as mammoth and bison. These hardy cavemen and cavewomen survived one Ice Age after another. But eventually, their luck ran out. For reasons which remain unclear, Neanderthal populations went into terminal decline. By 35,000 years ago, the Neanderthals had vanished from most parts of Europe. But in 2006, scientists dropped a bombshell. They had found evidence that a small population of survivors clung on in Iberia - modern Spain, Portugal and Gibraltar - until much more recently. This evidence came from radiocarbon dates obtained from Neanderthal campfires in Gorham's Cave, a natural shelter cut into the Rock of Gibraltar. Professor Clive Finlayson led the research: "You had Neanderthals - in our opinion - quite late from some of the dates; and by late we're talking in terms of 24,000, some would say 28,000. "Either way, much more recent than the latest estimates, some of which were putting them at 30,000, the last ones; and some of them as far back as 35,000." Professor Jose Carrion, who researches ancient ecosystems at the University of Murcia, Spain, comments: "Southern Iberia, especially the southern coastal shelf was an area of high biodiversity and resources - food and water. The Neanderthals inhabited open spaces - such as grasslands, dry lands, but also mixed oak, pine and juniper forests, savannah, rocky habitats. "There were various different types of animals. So there were many possibilities for survival here. It was a good place to stay, which was not the situation at this time in northern and central Europe." But a few thousand years later, even this population was gone. What wiped out this last band of survivors? Two years ago, Clive Finlayson's team claimed to have found a key piece in the jigsaw puzzle. Professor Finlayson says: "What we found was a climatic event in the marine core, taken offshore from the Iberian margin. We found confirmation of other people's results that there was a moment when the sea surface temperatures are the lowest for the previous quarter of a million years. "We have other suggestions of climatic features from the core suggesting that for a short period of time things got really quite tough." This event, known as Heinrich Event 2, could have caused severe drought conditions in Iberia, affecting the supplies of food and water for the last isolated bands of Neanderthal hunters. But this was one of a number of Heinrich Events which occurred over a period of several thousand years. 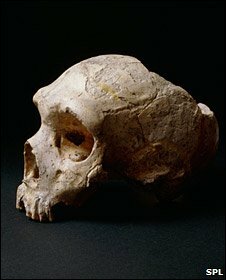 If climate was crucial in seeing off the last Neanderthals in Iberia, could it have played a role in the decline and eventual disappearance of the Neanderthals in other places? Scientists have always envisaged an important role for our direct ancestors - Homo sapiens - in the Neanderthal extinction across Europe and Asia. After all, modern humans arrive on the scene just as the Neanderthals start to vanish. Surely that was too much of a coincidence, wasn't it? Professor Chris Stringer, of London's Natural History Museum: "For many years, people assumed that it was an overall superiority of modern humans: that modern humans were more intelligent, that they had better technology, or had more effective adaptations. "They thought that when they came into Neanderthal regions, the Neanderthals very quickly disappeared, because they were out-competed. What we've learnt recently, is that the story was much more complicated. There probably wasn't a single cause of the Neanderthal extinction. They may have died out in different places for different reasons." But an exceptionally cold and variable climate might have driven the disappearance of Ice Age animals upon which the Neanderthals relied for food. In addition, climate change probably cleared Europe of its forests, creating an open environment that did not favour the Neanderthals. Had the role of our ancestors in the Neanderthal extinction been overstated? Back in the UK, Clive Finlayson's research had piqued the interest of Chronis Tzedakis, a professor at the University of Leeds: "One of my main interests is to place various events on land in their broader climate context of what is going on generally in the North Atlantic and European areas. So my immediate reaction was, what was climate doing at that time?" But putting archaeological finds - including the evidence from Gibraltar - in their climatic context is problematic. This is because calendar dates and radiocarbon dates do not exactly match up. "The radiocarbon chronometer is like a clock that is sometimes running faster, and sometimes stops," says Professor Tzedakis. "So there are differences between radiocarbon years and calendar years, and that complicates trying to work out what is going on with the climate for a given radiocarbon date. The reference archives (Greenland ice cores) that we have for what climate was doing are in calendar years. And the discrepancies can be up to thousands of years apart." Luckily, Konrad Hughen, of the Woods Hole Oceanographic Institution, US, had been working on a record of climate off the Venezuela coast and had taken radiocarbon dates from hundreds of points along the core. The changes in that core were very similar to those from Greenland and the western Mediterranean, suggesting that the whole North Atlantic system changed in unison when climate flipped back and forth. So the Venezuelan record is a "Rosetta Stone", with climate and radiocarbon dates written on the same archive. Dr Hughen suggested circumventing the conversion to calendar years altogether and going straight from radiocarbon years to climate. Konrad Hughen's climate record has been described as a "Rosetta Stone"
Professor Tzedakis: "You can take any radiocarbon date from anywhere in the Northern Hemisphere and you can then map it on to the climate record of that particular site. So, for example, if you have a date of 24,000, you go down the core and say 'where do I get 24,000 radiocarbon years in that core' and then you see what the climate was doing - it's as simple as that." Professor Tzedakis took the last three radiocarbon dates for Neanderthals living in Gorham's Cave and tried mapping them to the core from Venezuela. Much to his surprise, none of the cold events recorded in the climate archive from Venezuela coincided with the dates for Neanderthals living in Gorham's Cave. Most importantly, perhaps, the evidence for Neanderthals in the cave followed, rather than preceded, the Heinrich Events. If Neanderthals kept turning up after the big cold events were over, they must have survived them. To Professor Tzedakis, the conclusion was clear: catastrophic climate change could not have been the cause. But Clive Finlayson says that this interpretation misses the point: Whenever there was evidence of Neanderthals living in Gorham's cave, it meant there were still enough of them around to show up in the archaeological record. The actual extinction date would have to post-date any evidence of occupation in the cave. So according to Professor Finlayson, trying to match dates for cold spells to late dates of Neanderthal occupation in the cave was a flawed exercise. 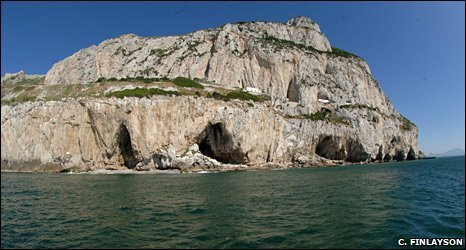 A crucial sticking-point is the 5,500-year period between the most recent claimed date for Neanderthals using Gorham's Cave and the first appearance of modern humans on Gibraltar. Both groups of scientists agree that, at some point during this period, a particularly severe cold spell known as Heinrich Event 2 occurred. But did it cause the Neanderthal extinction, or were they already gone by the time the climate worsened? Clive Finlayson comments: "The fact that they didn't find harsh conditions say at 24,000 or 28,000 radiocarbon years ago is exactly what we've been arguing. The plant and animal indicators are telling us it's still good. So when do the Neanderthals disappear from Gorham's Cave? "All we can say is somewhere between 24,000 and 18,500, which is when the modern people come. We're not going to say it's at 19,000 or 20,000, because we don't know. It's somewhere in between." Chronis Tzedakis is not convinced: "Heinrich 2 is at about 20,000 radiocarbon years ago. 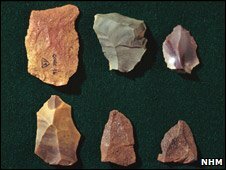 The latest date we have at Gorham's is 24,000 radiocarbon years ago and that would suggest that the two events are not really related. "Now, it is possible that you could have had Neanderthals surviving at Gorham's longer than that. Certainly that date is a last occupation when there are enough Neanderthals around to be detected. But I find it very difficult to see how they could have gone for another 3-4,000 years in the same place and remain undetected. But if, as Professor Tzedakis believes, catastrophic climate change didn't kill off the last Neanderthals, what did? Chronis Tzedakis: "Of course, the great debate was, was it anatomically modern humans that did them in. Certainly, there are strong views on each side. "I think what we have managed to show is, in a sense to simplify the equation, and I think we can be reasonably certain it was not the effects of abrupt, catastrophic climate change and Heinrich Events that were responsible. Now, that does not mean that climate was not involved at all. "It is entirely possible that you had a combination of factors, perhaps competition from modern humans at a time of limited resources. Because climate is deteriorating at that time - we are moving into the glacial maximum. So resources are scarce; but, on the other hand, climate alone is not the most parsimonious explanation. So I think the jury is still out on the factors that may have been involved." Both sides agree that many factors probably contributed to the long-term decline of the Neanderthals across Europe. But, according to Clive Finlayson, competition with modern humans is an extremely unlikely reason for the demise of the last populations in Iberia. Firstly, the two human species never overlapped in Gorham's Cave and therefore could not have competed. In addition, the evidence for modern humans in southern Iberia is scant - if not entirely absent - until well after the Neanderthals were gone. Clive Finlayson: "For me it's very exciting to see this whole thing as a complex mosaic rather than Neanderthals v modern humans. Here come the good guys - the clever guys - and wipe out the others. That has been the traditional argument. For me, that is extremely simplistic." 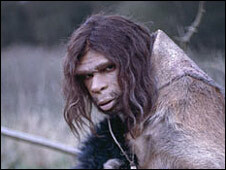 Some researchers have even been questioning the dogma that Neanderthals were adapted for cold conditions. During his work on the Stage 3 project, a collaborative effort to understand the effects of climate on flora and fauna during the last Ice Age, Dr John Stewart built a database of animals that existed at the time Neanderthals became extinct. 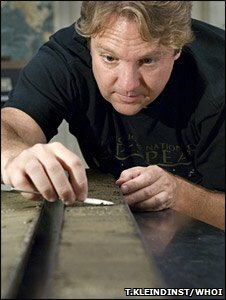 "What we found was that, contrary to suggestions that Neanderthals were cold-adapted, they seemed to react negatively to the cold, by contracting their range in a south, or south-westerly direction - in the direction of the Iberian Peninsula," the London's Natural History Museum researcher said. "It was also apparent from the animals they were most likely to be associated with. We compared the animals found on Neanderthal sites with those on modern human sites. Neanderthals tended to have a greater preponderance of woodland or closed-habitat animals. Woodlands, generally speaking, indicate warmer conditions than do open grasslands. "Animals that are found on open grasslands tended to be found on modern human sites. This suggested that the different humans had different preferences for habitats and that any suggestion of competition might be overstated at the very least and might be wrong as a cause for Neanderthal extinction." Chris Stringer comments: "I do think the climate was an important part of this story. With much better climatic records, we've been able to appreciate this. The time when modern humans were coming into Europe and Neanderthals were disappearing was a time of great climatic instability. "The Neanderthals, as much as anything, were unlucky. Not only were they hit by a new population coming into their area, perhaps with some superior adaptations with regards to behaviour and technology, but they were also hit by great climatic instability. This in a sense heightened the competition." Perhaps the mystique that has built up around the Neanderthal extinction is rather unjustified. Some scientists regard these humans as one of the many mammals which went extinct during the last Ice Age. "The Neanderthals were our closest relatives. They went extinct and there is a certain amount of fascination about this. I think that's where one draws the line. There are all sorts of interesting problems in palaeontology and palaeoclimatology. This is one of many. It just happens to be more fascinating for the public - so be it," says Chronis Tzedakis. Ultimately, perhaps, the debate over the extinction of the Neanderthals serves to obscure that, for a time, they were an incredibly successful species. "They survived for three or four hundred thousand years on the planet, which is a lot longer than us. And they did a very good job of it," says Clive Finlayson. "As far as I see it, they are intelligent human beings. Different, but when has difference meant superiority or inferiority? That's the take-home message I would have about our understanding of the Neanderthals today. A parallel form of being human. "It is quite sobering that at one point in the history of the planet, there were different types of us of which one - possibly by chance - survived. In other words, we might be the Neanderthals discussing this today."